Abstract: Columbia Water & Light is a municipal electric and water utility with a number of energy education programs. By hiring a full-time education and outreach coordinator, Water & Light has been able to create connections with existing audiences in the community. Historical and current programs have earned awards for the utility. Water & Light’s education programs touch on the science, math and social forces behind energy in the community through projects with adults and children alike. By addressing energy education from a number of angles, Water & Light hopes to provide the community a holistic view of their energy use and how they can improve, with a goal of increasing participation in the utility’s efficiency programs. Short descriptions of a number of programs highlight the work that Water & Light’s education and outreach team has developed over a number of years. Columbia Water & Light is the municipal electric and water utility in Columbia, Missouri, a city that prides itself on education. Our utility has a division of 17 full-time employees dedicated to providing energy services such as efficiency programs, renewable energy programs and energy audits. We are also responsible for education, marketing and outreach efforts surrounding energy efficiency and renewable energy. Columbia Water & Light’s energy education programs target public/private schools, other youth-serving organizations and the general (adult) public. As a municipal utility, we are part of the city government. With our local journalism-heavy climate (Columbia is host to the University of Missouri and its renowned journalism school), media coverage is key to promoting our programs and events. By conducting numerous public outreach and education activities, we hope to be able to show that our goals are to serve the whole community and give back to our customers. In June of 2013, I was hired as Water & Light’s first full-time Energy Educator. The fact that a utility of our size found it worthwhile to create such a position speaks volumes as to the community’s support for education. Being able to concentrate on education and outreach efforts has led to some amazing partnerships and connections, such as with Columbia Parks and Recreation’s summer camp program and the Good Shepherd Lutheran School Science Club, among others described later. Our energy education programs go beyond the K-12 arena to reach adults as well. In 2000, the Conservation Tips video series was launched, which provides quick lessons about home energy savings through YouTube videos produced by our City Channel videographers. We have reached out to all the Rotary, Kiwanis, Cosmopolitan, Lions and Optimist clubs in the community, a number of real estate agencies, and have been invited to speak at other functions on energy topics. In Columbia, Water & Light is seen as the face of energy education, and we are proud of that impression. Our education programs have earned us a number of awards. Conservation Tips earned a finalist slot in the 2002 Telly Awards (given to the best in creative video). The National Arbor Day Foundation has consistently recognized Water & Light’s efforts to educate the community about trees and their relation to safe and reliable power delivery with the Tree Line USA award. In 2014, we were recognized by the Missouri Environmental Education Association with the Outstanding Service to an Agency, Organization or Business Award, which is given to a group that meets high standards of environmental education in their community. What follows are brief descriptions of some of our largest and most impactful energy education programs, in the hopes that others may take inspiration from them and find our approach to energy education useful. In the 1980s, we launched one of our first and most popular education efforts in the community: the annual calendar contest. Water & Light partnered with the art departments in Columbia’s public and private junior high schools on the contest, which engaged students in both learning and teaching about energy/water topics. After an introductory presentation from Water & Light staff about our programs, the students began working on illustrations and catchy phrases to help promote those programs to the community. 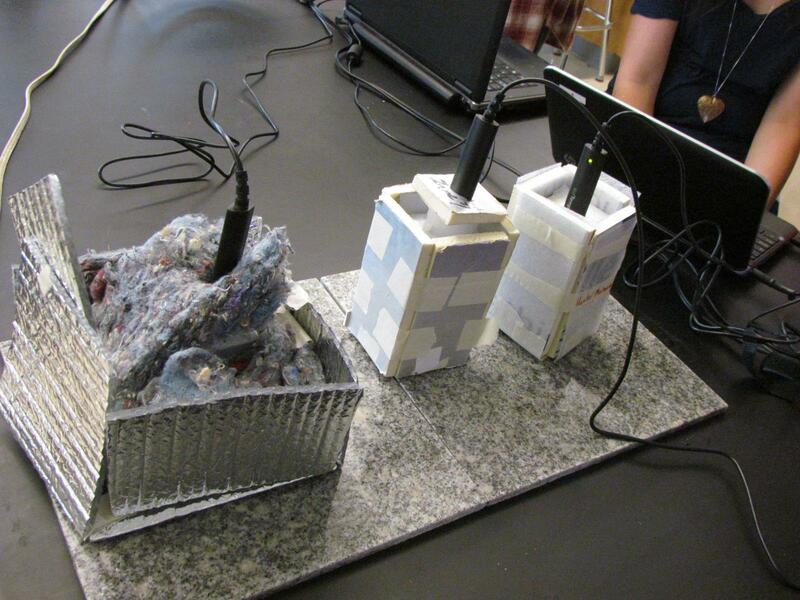 Students often came up with very creative ways to market energy efficiency and renewable energy programs. “Think about your power every time you take a shower” accompanied a drawing of an overworked water heater in one example. Insulation was depicted as a pink knight defending a house from an invading wind. Money really did grow on a shade tree. The junior high humor coupled with unique and colorful artwork provided a great hook to encourage the community to participate in energy efficiency programs. Meanwhile, students often came away with a greater understanding of energy topics by having participated in teaching others about them. Unfortunately for the calendar contest, CPS rearranged their curriculum and reconfigured their middle schools and junior high schools in 2013. After decades of partnership on the calendar contest, there was no longer room in the art curriculum to host the project. To scale back would have caused other issues; getting 14 quality entries each year from a voluntary contest would likely have been very difficult. In 2014, we put out a “best of” look back at clever and creative entries from the past and ended the calendar. In its place, we are currently piloting a marketing contest focused on heating and cooling efficiency; students will be submitting haikus, radio spots and/or posters. Saturday Science is a Columbia Public Schools program in which 8th grade students take Saturday morning field trips to local STEM-related businesses and conduct hands-on projects in the relevant fields. Since the early 1990s, Columbia Water & Light has served as a destination for these students. Starting in 2014, we also began hosting another session of the Saturday Science workshop to which we invited local private and home school students, which was very successful. Considering we had already planned the project for our CPS student scientists, we found it easy to offer this session and incorportate these learners as well. In 2014, our project focused on solar energy. We provided students the opportunity to do two things: (1) construct their own solar cells out of copper plates and electrolyte solution; and (2) explore circuit concepts of voltage and amperage through assembling solar cells to power various small devices. By constructing a solar cell, students were able to identify the important aspects of solar energy generation: creating a potential difference and providing a means for electrons to transfer between the plates. While solar technology is much more complex than that, the basic physics of creating solar energy was demonstrated for students, which we found to be powerful and de-mystifying. After all, as solar energy grows in demand, these students will be creating the future photovoltaic cells to power our energy needs. Recently, we partnered with Battle High School (one of three local public high schools) to create a project we call Bottle Battle, in honor of its origin. In the Bottle Battle project, students are tasked with insulating a plastic water bottle (a mock water heater) to slow down the transfer of heat from the water to the environment and to achieve the highest energy savings for the lowest cost. In addition, students need to keep the water hot in order to stop the growth of a waterborne “zombie virus” that is fictionally ravaging their community. We piloted Bottle Battle in 2013 to great success with one Physics teacher, and in 2014 expanded to all five Physics teachers in the high school. Students work in groups to study insulation types, learn what R-value signifies, and determine the best combination(s) of insulation to attach to their “water heater” bottle. We also provide a meaningful connection to the students’ upcoming unit on waves by testing each bottle’s performance with an infrared camera (Photo 1). Students are thus able to see both the water temperature drop and find out what aspects of their bottle are causing the thermal energy to escape. Therefore, students are learning many aspects of energy through the project – heat transfer (conduction, convection and radiation), insulation, infrared thermography and how a water heater works. present their bottle’s strengths and weaknesses to the class. There is also a math component to Bottle Battle, as students utilize time-temperature line graphs to compare different kinds of insulation, perform multi-step calculations to arrive at their final “Bottle Battle score” and analyze cost as one factor of their design. 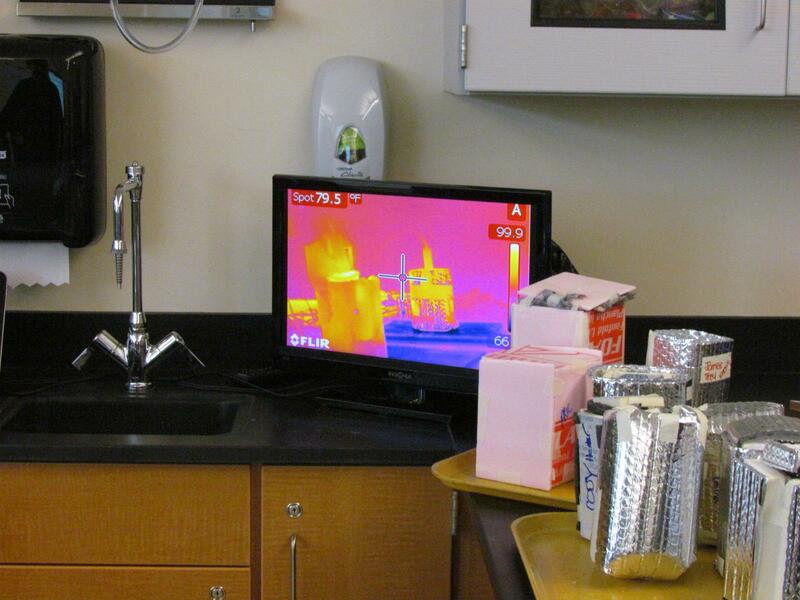 Another project that has existed since the 1990s is currently known as Energy Choices, and provides middle school students with another means to learn about thermal energy alongside math. Like Bottle Battle, Energy Choices students are also performing a complex, multi-step calculation; in this case, to arrive at the cost of their average shower. We focus here on the energy required to heat up the shower water, though depending on one’s focus, the project could be extended to include the costs of the water itself and the sewer costs associated with the shower. Students first determine their showerhead’s flow rate using a utility-provided bag, and then time their shower to determine the amount of water they use. Students perform calculations using Btus (which they have been exploring before they begin working) and arrive at the number of Btus required to heat up the amount of water in their shower. Finally, students translate that number of Btus into kWh or CCFs of energy (electric or gas heaters, respectively) and calculate the cost of that in the local market. This provides a number of steps for students to do, all while giving them a meaningful real-life result that they can use at home to reduce energy usage. Energy Choices has long been a staple of the science curriculum in middle schools in our district. Teachers who facilitated Energy Choices with us found remarkable success in getting their students to achieve behavioral changes in their shower’s energy usage. We have been told that parents would remark about the project’s success during parent-teacher conferences, and many noted that their students were taking more responsibility to not waste hot water once they looked at the costs associated with it. Another aspect of Energy Choices that teachers and parents saw value in was getting students to be interested in how their home works, since often students had to look at the water heater itself to obtain information used in their calculations. Another new program as of 2013 is Budgeting for Energy, a short in-class presentation given to 10th grade Personal Finance students in each of the district’s three high schools. In Missouri, students must take Personal Finance to graduate, so we chose to utilize the opportunity of a curriculum shuffle to get in the door. Students are already budgeting other monthly expenses as part of a class project, such as rent, car payments and groceries. This 30-40 minute presentation covers a number of utility cost topics to complement their unit, but most importantly asks students to look at energy efficient technologies and plan out the costs into the future. We do this with refrigerators and light bulbs, but one could include any number of technologies in such a presentation. One of our biggest events of the year is the Advancing Renewables in the Midwest conference, which we co-host on the University of Missouri campus. We know that eventually, fossil fuels will become economically unviable even as the last remaining reserves go untapped. We want to be prepared for that future. By hosting a prestigious renewable energy conference, we demonstrate that commitment to our community. Energy professionals from all over the state, region and country attend this conference each year and hear from experts in efficiency, biomass, wind and solar. The upcoming 2015 conference will be the tenth annual event. We have also presented to groups on the renewable energy we utilize here in Columbia. Columbia’s city council passed a renewable energy mandate which requires an ever-increasing percentage of our energy to come from renewable sources. This presentation covers each renewable source in some detail, showcasing the variety of types of renewable energy and the pros and cons of each being integrated into our grid. This presentation is well-received by many environmental groups, such as the University of Missouri’s Environmental Leadership Office, to show what Columbia is doing to move toward alternative green energy. a small wind turbine on the University of Missouri campus. Additionally, I have presented on energy education at statewide conferences, such as those hosted by the Missouri Geographic Alliance, Missouri Environmental Education Association and Science Teachers of Missouri. Some of Water & Light’s activity plans have been featured in such resources as environmental education publications, energy sector blogs and the American Geophysical Union’s LEARN video series. We recently developed a short project for elementary school students themed around the idea of Right Tree, Right Place, which is a motto of many arborist organizations and an important consideration for our community. In July 2014, we experienced a very damaging summer storm which took out power to over 14,000 customers at its maximum. Cleanup took nearly a week, and involved aid from 5 other municipal utilities in Missouri. Most of the electric grid damage came from trees falling into or onto power lines, including some high-voltage transmission lines along a major roadway. Although the Right Tree, Right Place project was developed for an Arbor Day celebration before the storm, it took on new life and a new meaning to students in the storm’s aftermath. Photo 2: Students at Columbia’s Lee Elementary School place trees onto the community map at Lee’s 2014 Arbor Day celebration. By hosting this activity outdoors, students could see the real-life shading effect of trees on homes. 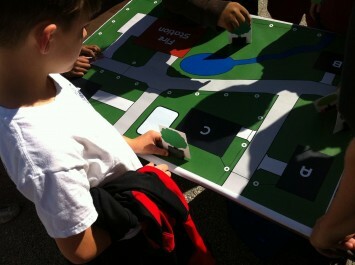 The project involves a computer-drawn map of a mock neighborhood, including streets, driveways and power lines (Photo 2). Students are given a number of trees (we used cardstock cutouts) to place on the map, and are led in a discussion of where trees can go without causing problems. Students often have insight into their own experiences with trees – they can see the benefits of shade, the dangers of placing trees near power lines, and the often embarrassing moments when bird droppings from a tree have hit them or their friends. Although the neighborhood from the map is fictional, students quickly adopt it and try to find the best solutions for placing their trees. This project not only showcases energy savings as important (through shade trees), but also promotes a sense of place as students are in essence “decorating” their community while performing the task. Every civic group in Columbia (such as Rotary, Kiwanis and Lions clubs) was approached to receive this presentation. It has been well received, and many attendees provided testimonials from themselves or their friends who had participated and seen the success. The success of reaching out to these groups has spurred the creation of a “spin-off” presentation given to real estate groups in Columbia that provides a focus on using the Home Performance program’s parameters in marketing homes to potential clients. The above activities are not the limit of energy education activities at Columbia Water & Light. For instance, partnerships with the local Parks & Recreation department have allowed us to incorporate energy projects into summer camps. We have utilized solar panels at a local elementary school to engage first grade students into thinking about solar energy. Meteorology students at Battle High School will be exploring the connection between weather and energy usage. We are fortunate to live in a community so supportive of education. These projects would not have been possible without the support of our education and community leaders. In turn, we have been supportive of the needs of educators, working our messages into existing units and attempting to meet new educational standards whenever possible. By forging connections with a variety of groups, we have been able to share vital messages about energy efficiency and renewable energy with populations from kindergarten to senior citizens.